This is a poem I wrote a long time ago. Unknown vistas, lift and sore. I am amazed by all the stories about people who wrote, painted, or created while dunk or high. I know, this shouldn’t amaze me. I’ve read some interesting books on LSD, and the scientific studies that were done before the bathtub version was available outside the laboratory. It is all quite fascinating. I say this as a person who has never done anything harder then a shot of whiskey. Here I am, after drinking a bottle of “Mocha Death” from Iron House Brewery (the best beer EVER btw) and… I couldn’t write if my life depended on it. Well… I’m writing this. I’m also expecting to do terrible things with it. I think the idea behind a substance and creating, be it art, writing, or whatever, is simply this: when you are slightly tipsy you turn of that internal voice that is constantly whispering at you that you are going to fail, you are wrong, your writing/art/whatever is AWFUL! The trouble I have with the whole thing is that when I wake up completely and entirely sober I am going to come back to this and read it. The spelling will be correct, but only because of those ugly little red squiggle lines under so many of my words. But the grammar? The flow? The ideas behind it. I think I’m going to post this anyway. And to all my brethren who have a nice glass of wine while sitting down to write that long epic that has been brewing in your mind I say GO FOR IT! Turn off the internal editor. Sit down. And write. Worry about everything else once the words are down on the paper. I think I’m going to go do the same. Some useful ideas you can use to keep writing. * Keep a notebook, computer file, or note taker on your phone/tablet at all times. * Write a few words when you’re waiting int the doctors office, or on hold on the phone, or the baby takes a nap. * While in the shower take the time to think out your story, maybe use colored soap, washable marker, or lipstick to jot notes on the wall and wash off later. * Get a recorder and talk to it about your story while in traffic. Remember NaNoWriMo isn’t just about finishing, it’s about setting goals and pushing yourself. If you can’t do 50k try a couple short stories. And remember, you don’t have to validate your NaNo with the actual story. You can copy “the lazy dog runs home” 10,000 times and paste that in, and just keep your stories in the notebook for now. Look around the room you’re in. Choose an object. Now write about it. Does it have fantastic powers? Did someone find it in an unusual place? Maybe someone just tripped on it sending them into an unusual situation. Try another object. Maybe they interact in some way. The interesting thing about this exercise is that the object can be as simple as a coffee cup, or as unusual as a figurine of a glass dancing bear, shimmering in the morning sunlight. One of my favorite writing exercises is the random word. Several years ago I joined a writers workshop that did Short Story in a Week. Five groups of five random words were given, and participant could use one or all of the lists in a short story exercise. Random are great ways to generate ideas. Take this generator. The fairy empire is in heated battle with the cheese loving citizens of Wisconsin, and taking to the sky, ready to attack! A silly sentence, but fun, and able to add more ideas. Search for random word generators on google. If you have a specific genre you like then add that genre. Try it a few times to get the creative juices flowing. 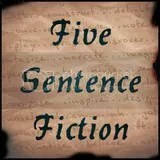 “5 Sentence Fiction” is an exercise to write a short, but complete story in just five sentences. This was a challenge set out by Lillie McFerrin. It isn’t the easiest task. You must have a beginning, a middle and an end, all in the space of five sentences. It is a nice little exercise to get the writing flowing, and may even help with writers block. “One a day keeps the Writers Block away”? The lattice structure lay dormant before him, the sheath of sterile cells impregnating every surface. Stretching, moving and oxygenating the growing flesh had taken months, now it quivered in anticipation. Dr. Haverd held his breath as he sent a shock of electricity through the first man made heart. There was a blip, and he sent another shock. His elation escalated as the heart began a steady bu-dum, bu-dum, in its dish. For some more examples there is a Reddit post about it. Feel free to drop your 5 sentences in the comments.